Microwave Devices produces rugged, reliable, high performance fixed attenuators with operational frequencies ranging up to 50 GHz. 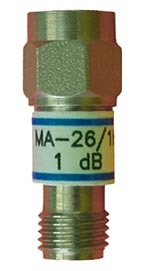 With attenuation values of up to 60 dB (depending on model), a variety of connector offerings suitable to the frequency and reasonable pricing, we're sure to have a high frequency fixed attenuator suitable for most requirements. All units are 50 Ohm impedance. 'H' suffix indicates the presence of .313(7.94mm) hex on the attenuator body. '1' suffix indicates shortened body length. Consult factory for attenuation accuracy on any specific model.